Family favourite. Use the relish with other dishes. Preheat the oven to 200°C, gas mark 6. Mix the flour and cayenne together. Dip the chicken thighs into this, then into the egg, and finally into the crust to coat completely. Place the chicken in a roasting tin, drizzle with the oil, then cook in the oven for 30 minutes, turning once until crisp and golden and the chicken is cooked through with no pink meat. Meanwhile, mix the sweetcorn with the sliced salad onions and chilli sauce. 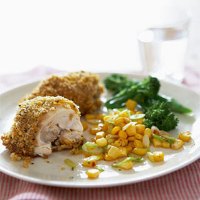 Serve with the cooked chicken and Tenderstem broccoli.